Independant Service engineer trained on Electro-hydraulic equipment for Commercial Vehicle & Municipal Vehicle. 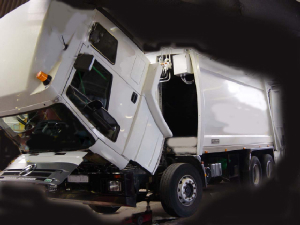 Auto electrical & Hydraulic repairs to Refuse Vehicle waste compactors including Norba RL35 , Heil Powerlink, Ros Roca, Semat, Schorling, Dennis Eagle, and Terberg Binlift gear. Security of bins relies upon correct setting of clamp gaps to avoid bins being released from lift during lifting operation. Automatic operation of bin lift requires all sensors to be operational. A failed sensor can stop auto function. Digital Input signals are taken from user controls such as Up or Down Control Station , Emergency Stop Switches, Sensors. Processing of input signals is done by a main programmable logic control (plc) board such as Part No 14803 to provide outputs. Failure of Inputs, power supply, wiring, or output faults can cause processor board to stop working. Processor boards are generally housed in steel or plastic enclosure for protection against moisture and chemicals. Output signals energise solenoids on hydraulic valve block to allow lift to raise or lower. Signals are sent to increase truck throttle revs as pto operates and flow from pto hydraulic pump circuit to be directed to services. Bin lift equipment for UK use must comply with Lifting Operations and Lifting Equipment Regulations (LOLER) 1998, and also be compliant with Provision and Use of Work Equipment Regulations (PUWER) 1998. Only trained personnel should operate or maintain lifting equipment. Service maintenance and repair contracting is only undertaken in accordance with our terms and conditions of trading which can be found by clicking the link marked "terms" above.